W/C The wetlands of East Anglia are beautiful. My husband and I rented a canal boat and spent 10 days slowly drifting along the canals. Mergansers, swans, grebes, and heron were just a few of the birds we saw. While docked at Thune Mill, I saw the Mergansers and had to paint them. 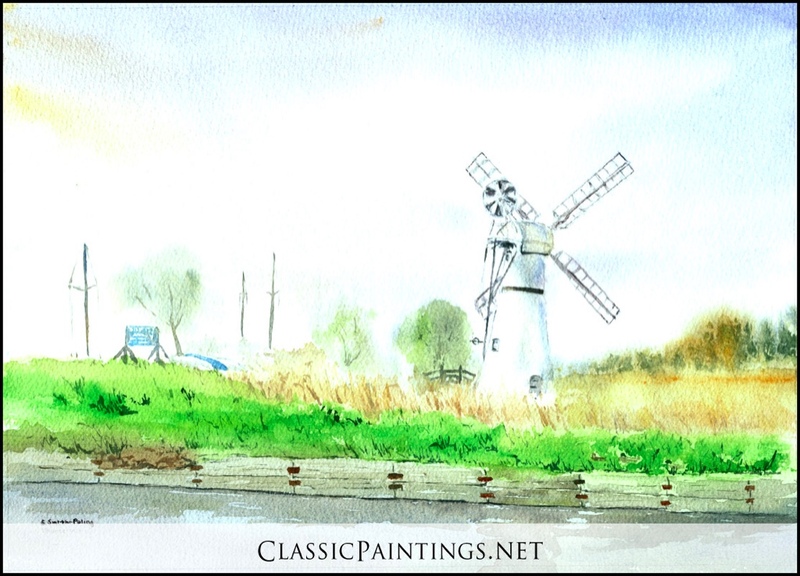 The windmill pumps out water from the fields behind the dykes. The Broads were made in the 11-13th centuries by digging out the peat to heat the Abbey’s. The dug out areas would fill with seawater. Now there is a very large area to sail, or cruise and to just enjoy the wildlife. W/C The wetlands of East Anglia are beautiful. My husband and I rented a canal boat and spent 10 days slowly drifting along the canals. Mergansers, swans, grebes, and heron were just a few of the birds we saw. 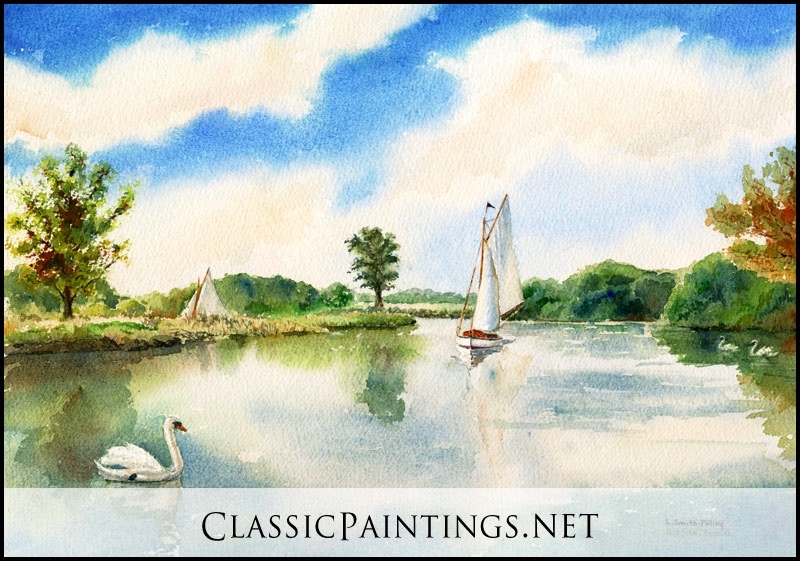 Sailing along the Broads is just so beautiful. 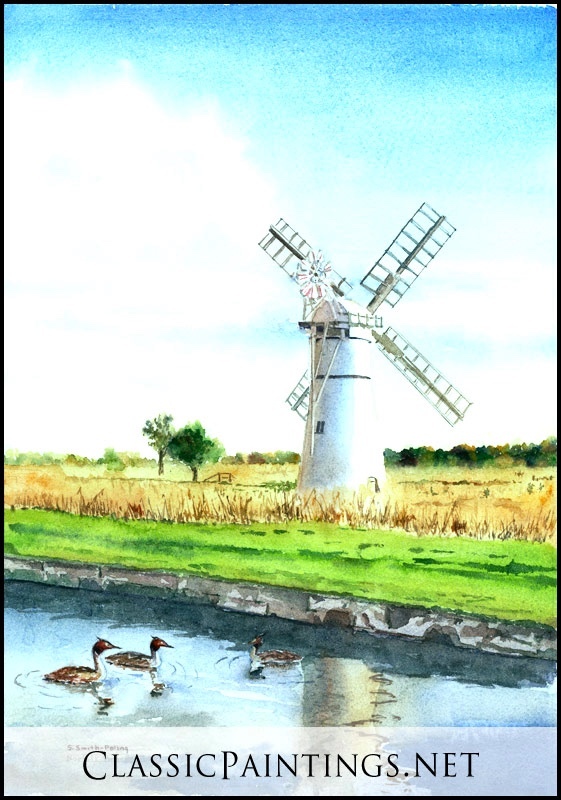 The Broads were made in the 11-13th centuries by digging out the peat to heat the Abbey’s. The dug out areas would fill with seawater. Now there is a very large area to sail, or cruise and to just enjoy the wildlife. 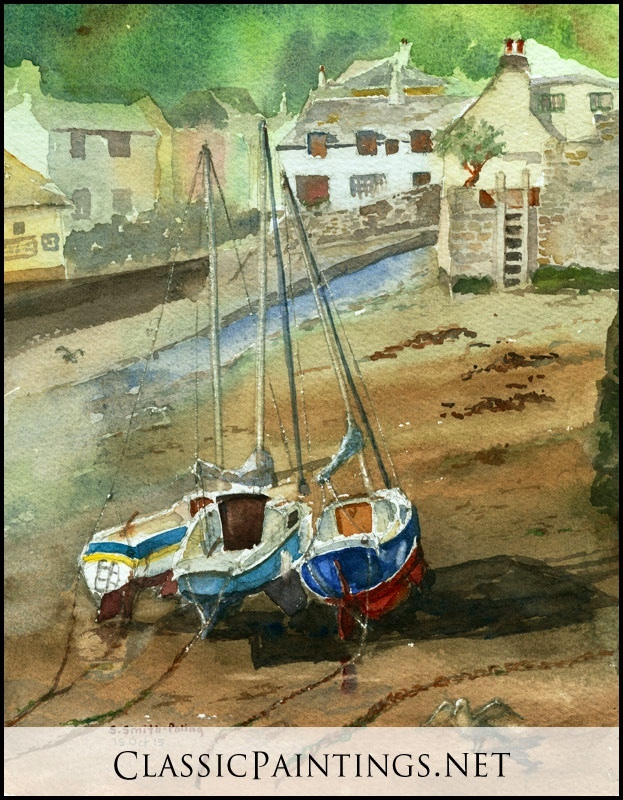 W/C St. Ives, Cornwall, England- The tides out, the reflections on the wet sands and the boats on their sides provided inspiration for this painting. St. Ives was immortalized in the nursery rhyme. 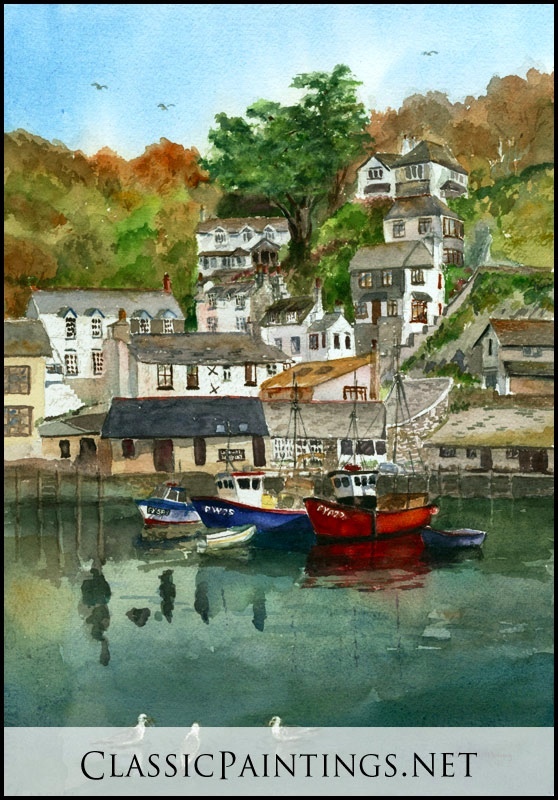 It is also an artist colony in Cornwall. Cornwall is the "English/Cornish Riviera" as it has the most sun and changeable weather in England. 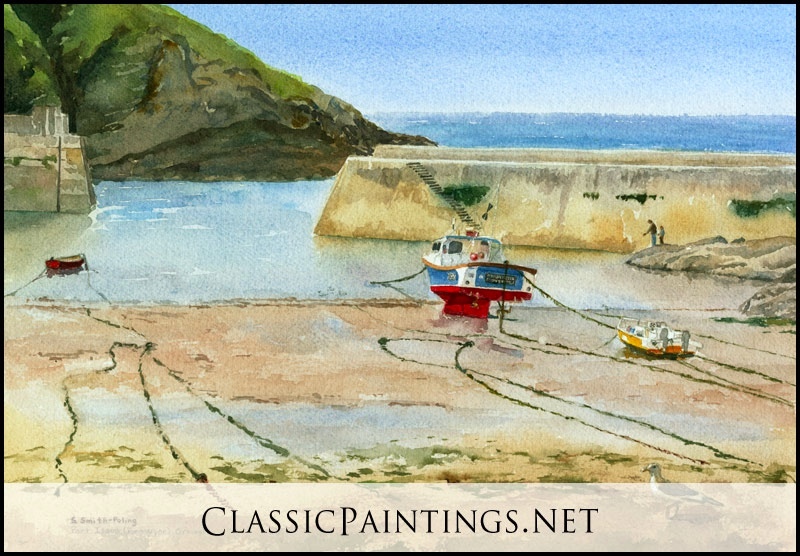 The fishing villages of Cornwall are always intriguing to paint. Of course wandering through the villages and painting is also fascinating. W/C Boscastle is thought to be the site of King Arthur’s castle. This charming cottage was at a small harbor. The English cottage gardens are a delight to behold. They always appear to be so casual (easy) and yet require much diligence to maintain. The children were enamored with this area. 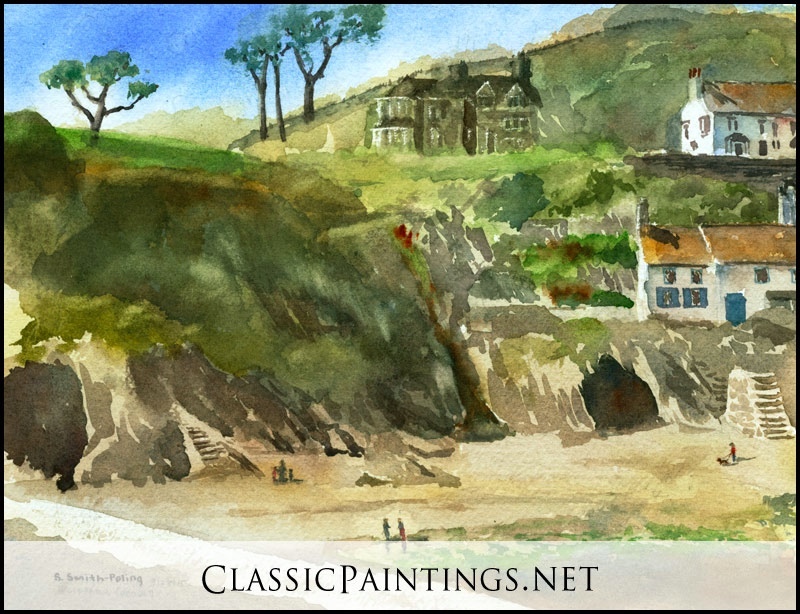 My father and I did numerous painting trips through Cornwall and Devon. 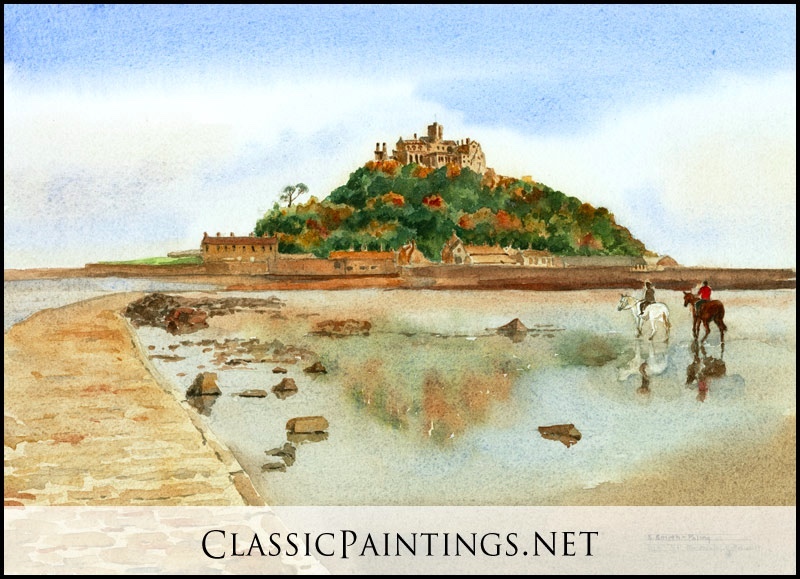 W/C St. Michaels Mount, Cornwall, England is the sister monastery to Mont St. Michelle in France. They were designed by the same architect and built nearly the same time. 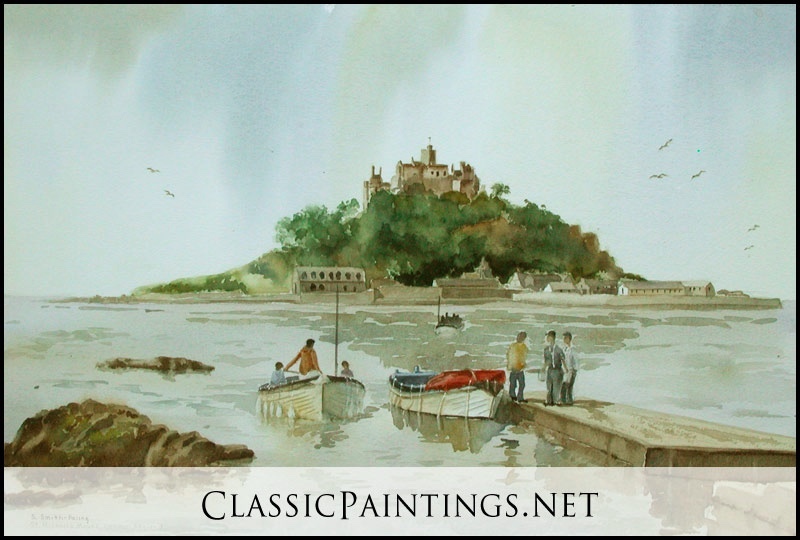 It was a lovely summer day with the children playing on the beach at Penzance, my father and I painting and my husband and mother enjoying afternoon tea. W/C St. Michaels Mount, Cornwall. October with the tide going out and a couple of horseback riders made this a lovely scene. Over 20 years ago I painted it with my father, Craig Smith. Now, I spent the day climbing and visiting the castle. W/C Mousehole, Cornwall is truly one of the loveliest fishing villages in Cornwall. The warm, late afternoon light gave a beautiful glow. In the 1960’s I spent delightful painting trips with my father, Craig Smith. I would bring him crab sandwiches as he painted in the harbor. Now I am painting in his place. 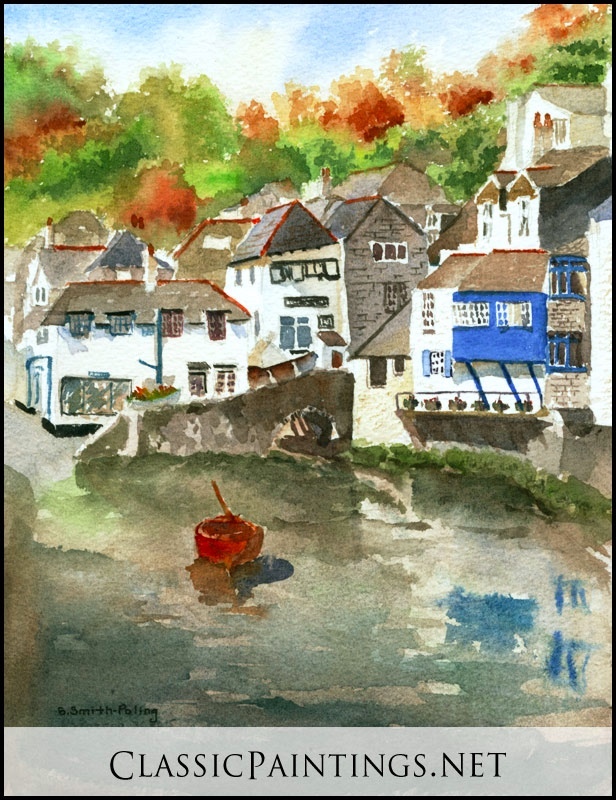 One local explanation for Mouseholes’ name is that it may derive from the Cornish Moeshayle, meaning "at the mouth of the river of young women", but some authorities argue for the literal "mouse hole", as being a reference to the original tiny harbour, or to a nearby sea cave. It was burnt to the ground by the Spanish Armada in 1595 (except for the pub owned by a Spaniard?) Through the harbor opening, one can see Mount St. Michaels in the distance. W/C I painted this by standing just outside our apartment. 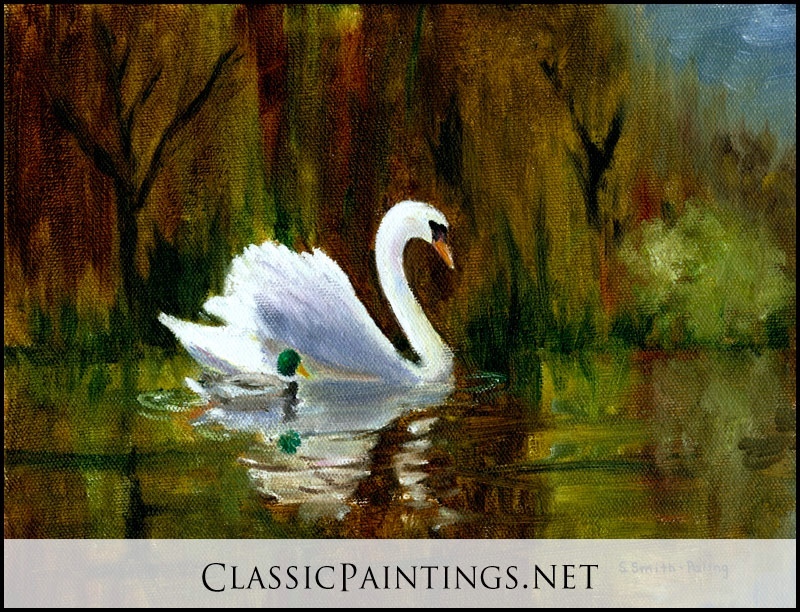 My husband, Mitch and two friends, Rod and Marilyn, and I rented an apartment for a month so Rod and I could paint! It was fantastic. 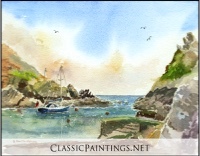 Everywhere one turns in Polperro there is wonderful subjects to paint. W/C Boats tie to the buoys outside the harbor to wait for the tide to enter or to run their dinghy’s into the harbor. 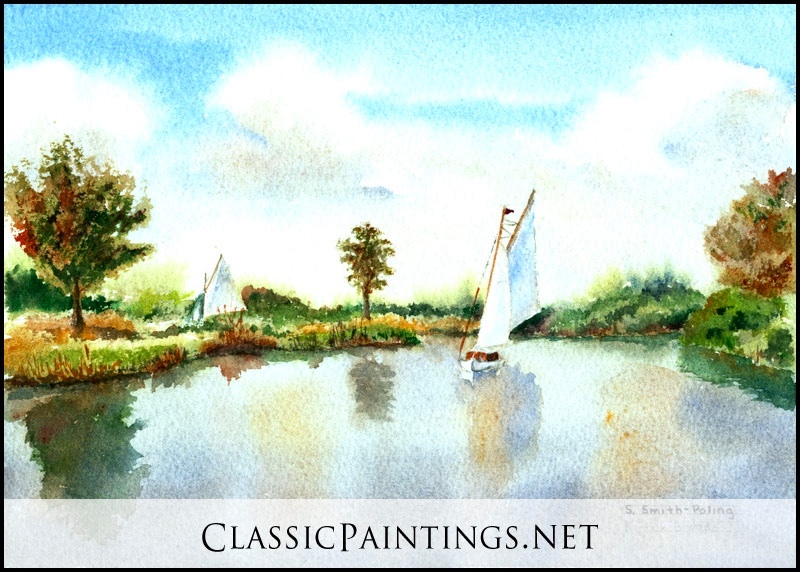 While I was painting, the crew came out in a skiff, climbed onto the CAPTIVA and sailed away! Fortunately I had already sketched it. This was quite a beautiful day. 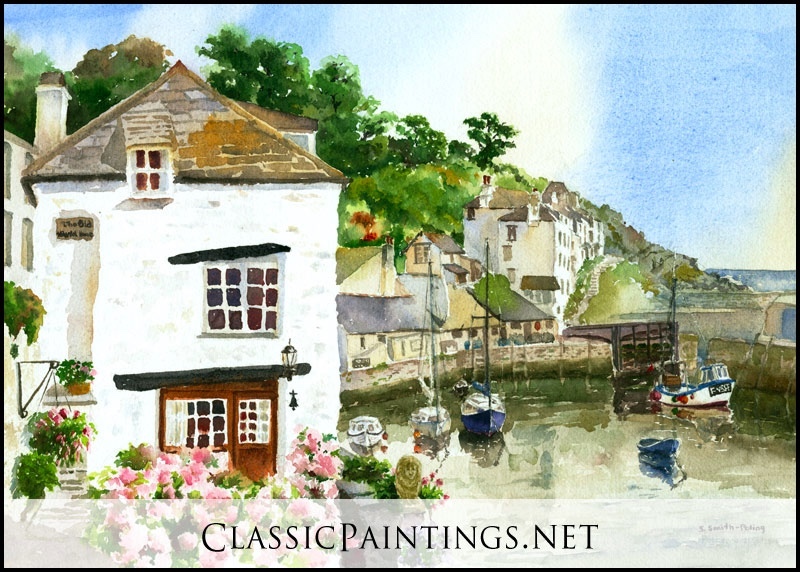 Polperro does have a storm gate that they close in rough weather to protect the town. My husband, Mitch and two friends Rod and Marilyn rented an apartment for a month so Rod and I could paint! It was fantastic. 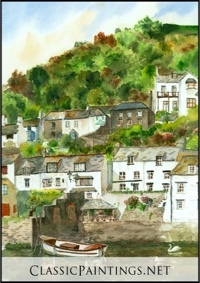 Everywhere one turns in Polperro there is wonderful subjects to paint. I was fascinated watching the seagulls. 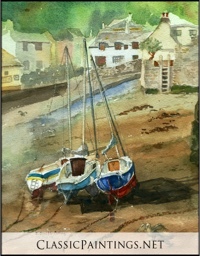 Everyday when the tide was out, they would bathe in the fresh water of the river Pol that flows through Polperro. W/C View of the caves and entrance to Polperro Harbor. The caves have tunnels in them…perfect for the old time smuggling! This view is from the outer harbor wall and breakwater. 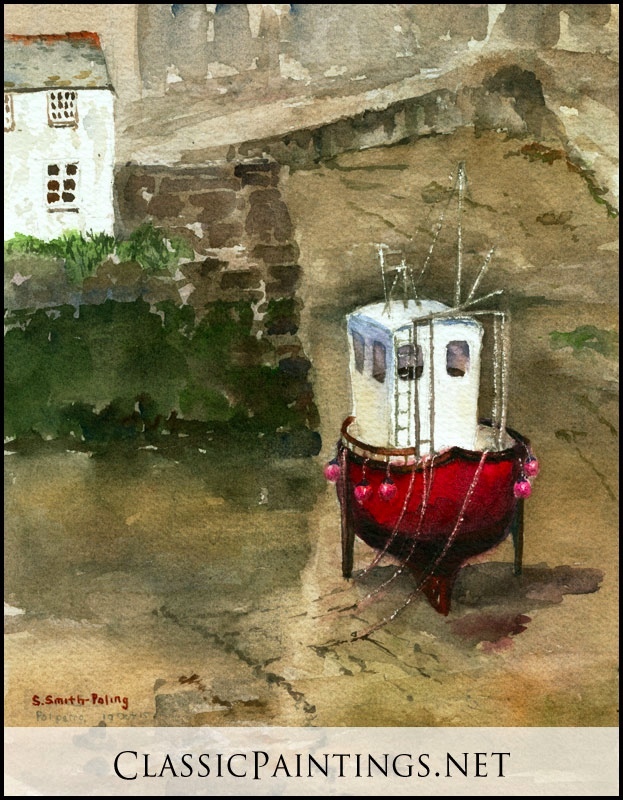 W/C I painted this scene of an old time wooden fishing boat hull as the tide was going out. I stood in front of the fish market. 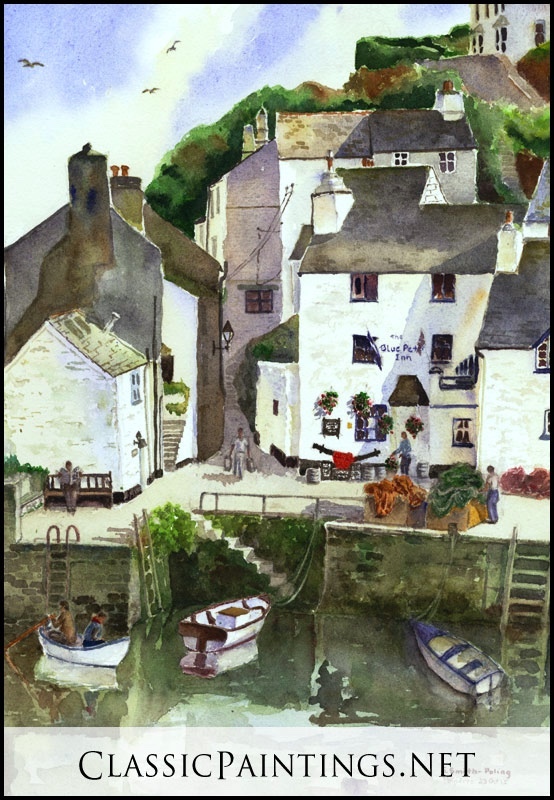 W/C Port Isaac, (Port Wynn) Autumn in Port Isaac. 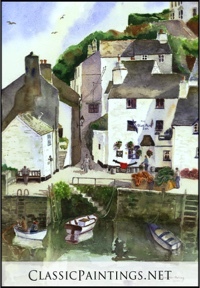 Port Isaac has become well-known as “Port Wynn” in Doc Martin’s TV series. It is still primarily a fishing village and specializes in lobster, crab, muscles and most shellfish. (Cockles anyone?) 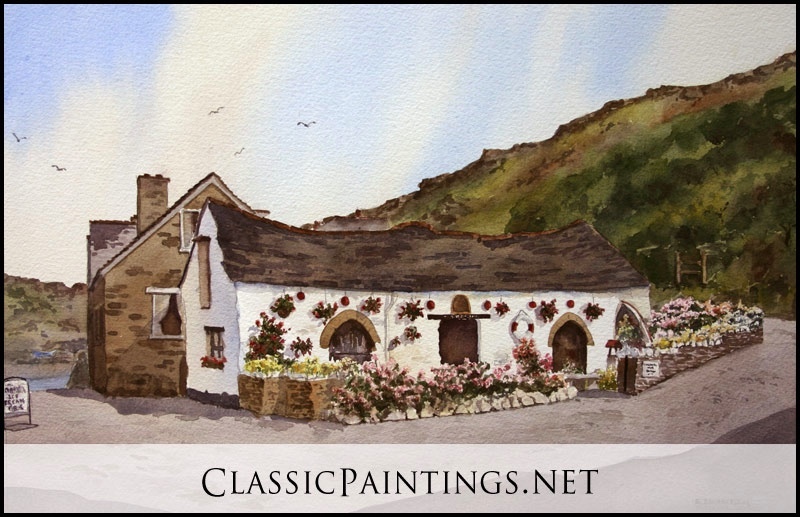 It is also very picturesque with winding streets, pubs and cafes…just a delight to visit and paint. We visited some long-time friends that live there and are still active in sea rescue operations. It was just a delightful time to paint and walk along the sea. W/C St. Ives. 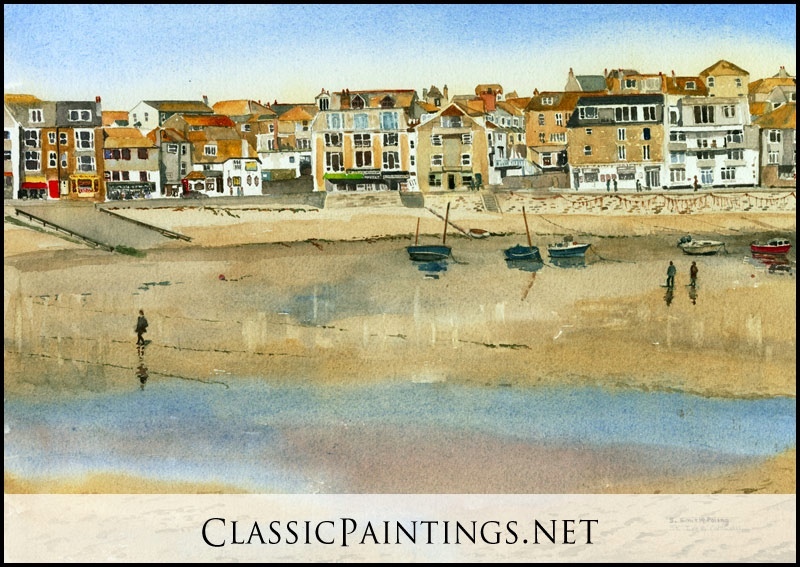 Autumn morning with beautiful light and reflection on the wet sands, St Ives is a fishing village and very popular with artists. Actually, it is an artist delight. 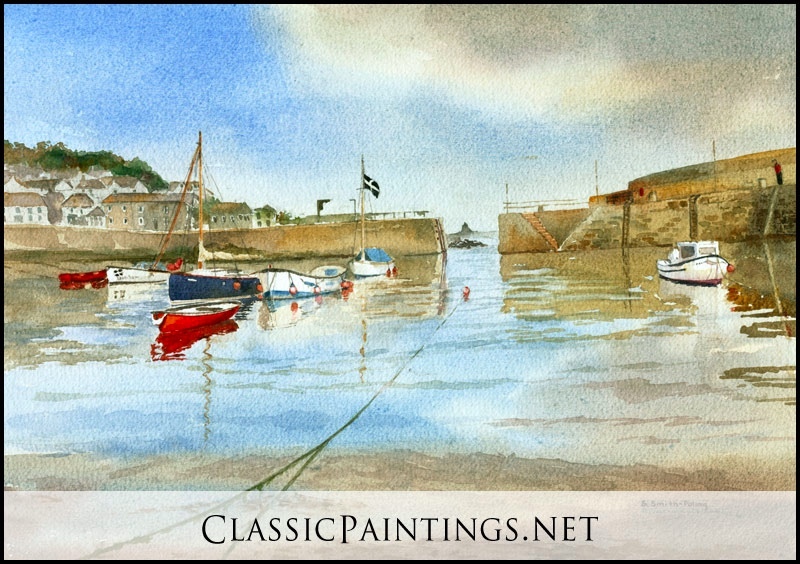 Fascinating boats, a lighthouse, winding streets, pubs and cafes…just a delight to visit and paint. W/C Polperro, Cornwall. 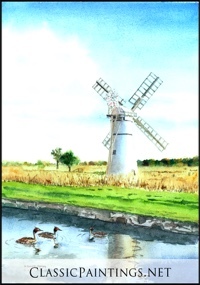 I painted this scene of the site of the old kiln. The apartment we rented, “Fairview Cottage”, can be seen just behind the small shelter. I stood in front of the fish market to paint. There was always this lone swan. I wondered if it had lost its mate. This morning was a high tide. W/C Polperro, Cornwall. When the tide is out, the boats often lean to the side. Some of them have Lee boards, Gar boards, Skids or twin keels to help keep them upright. 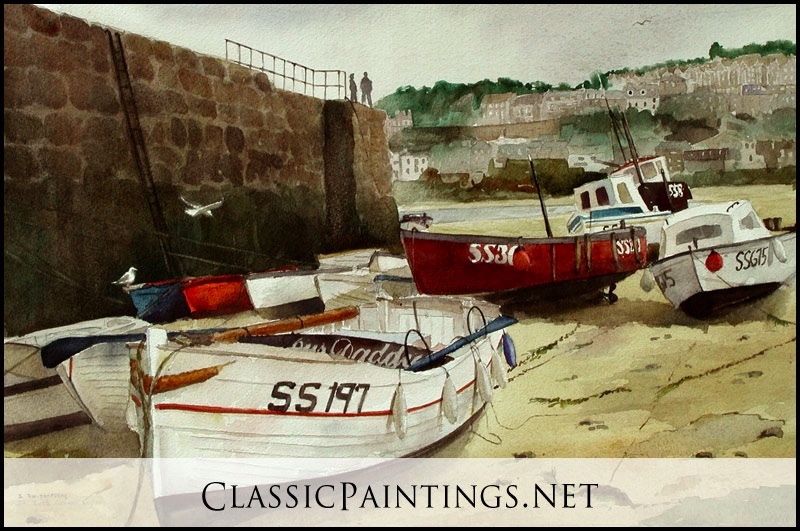 During the low tide, the sailors will often be out painting, scrapping or doing repair work on their boats. W/C Polperro, Cornwall. 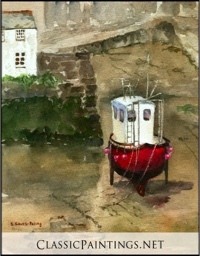 I painted this scene of an old time wooden fishing boat hull as the tide was going out. This view was looking up the Pol River. It was a beautiful autumn day. W/C Polperro, Cornwall. I painted this by standing just outside our apartment. My husband, Mitch and two friends Rod and Marilyn rented an apartment for a month so Rod and I could paint! It was fantastic. 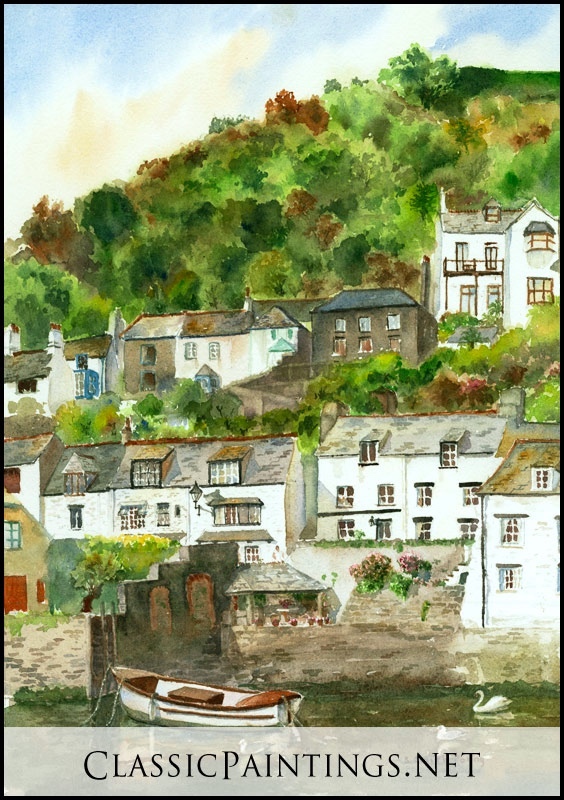 Everywhere one turns in Polperro there is wonderful subjects to paint. Built into the cliff by the outer quay of this famous Cornish fishing village, The Blue Peter Inn sits across the south-west coastal path (quite a long, beautiful walking trail). We had Cornish Cider and Ale many an evening at the Blue Peter. (The Blue Peter refers to the Admirals Flag). W/C Polperro, Cornwall. This was a classic fishing boat (double ended) that really looked like this. It was almost a cartoon and I just had to paint it. My husband, Mitch and two friends Rod and Marilyn rented an apartment for a month so Rod and I could paint! It was fantastic. 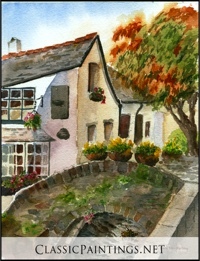 Everywhere one turns in Polperro there is wonderful subjects to paint. W/C Polperro, Cornwall. This is the old Forge. I found the roman style bridge and the autumn colors fascinating. My husband, Mitch and two friends Rod and Marilyn rented an apartment for a month so Rod and I could paint! It was fantastic. 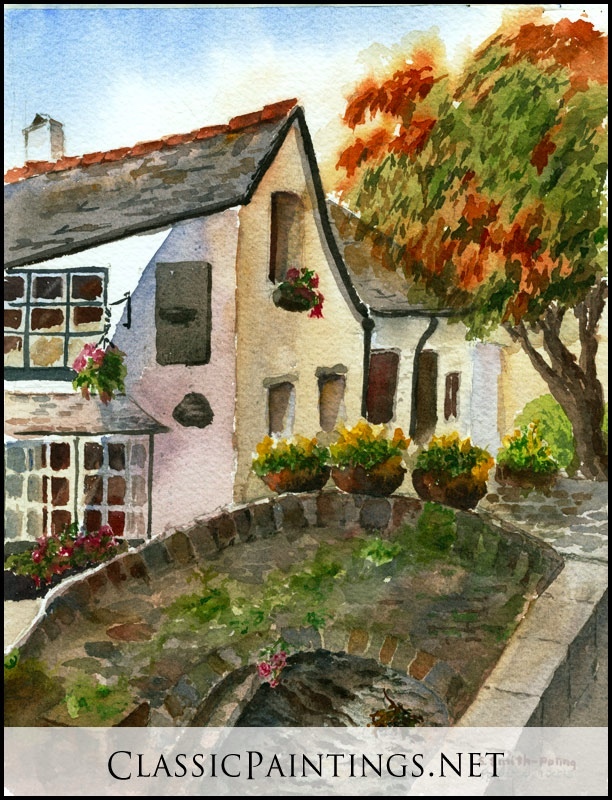 Everywhere one turns in Polperro there is wonderful subjects to paint. W/C Polperro, Cornwall. This morning was a high tide. 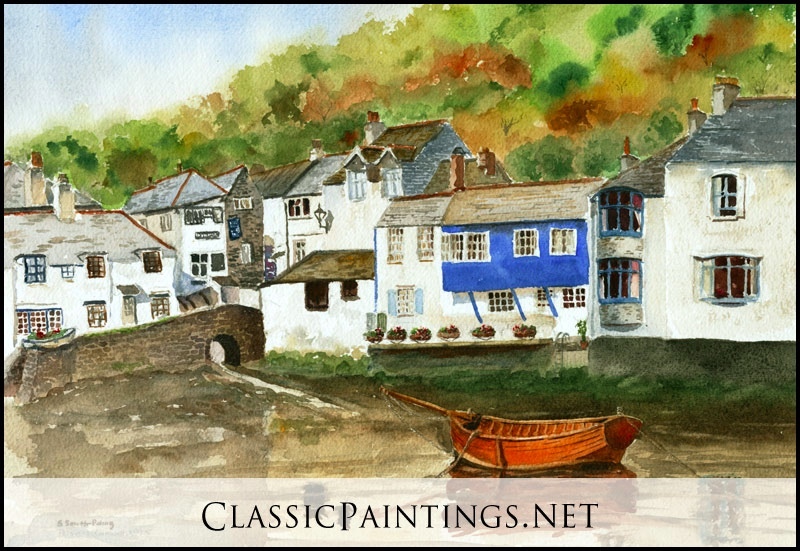 These were the “classic” Polperro fishing boats. In the background is the Smuggler’s Museum. 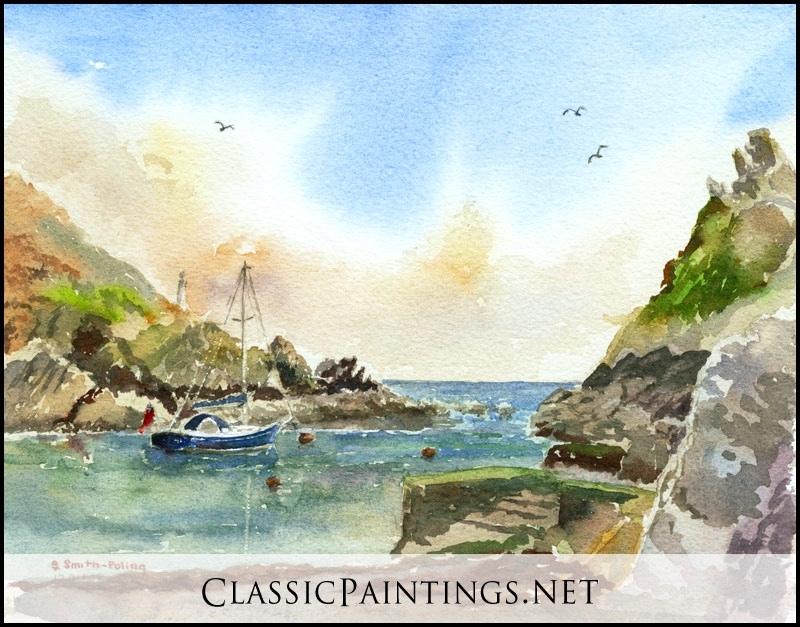 It was so calm and beautiful this morning that I just had to paint it. My husband, Mitch and two friends Rod and Marilyn rented an apartment for a month so Rod and I could paint! It was fantastic. Everywhere one turns in Polperro there is wonderful subjects to paint.